Volume 7 of Pecha Kucha Night in Bombay was held last month at the Balwant Sheth School of Architecture. The school made for a perfect setting to share ideas and network. Pecha Kucha Night was devised by Astrid Klein and Mark Dytham of Klein Dytham Architecture in Tokyo. Since it’s inception the event has turned into a celebration of work and Pecha Kucha Nights are held in hundreds of cities around the world. Pecha Kucha in Japanese means chitchat, the format is based on a simple idea that each presenter is limited to 20 slides and 20 seconds per slide. The format keeps things moving and presentations concise. In Bombay the event is organized by Kaiwan Mehta, researcher and theorist in the field of visual culture and architecture. Attended mostly by students also present at the event were industry professionals and artists. It was great to bump into friends from New York; two of them recently moved back to Bombay as well and one was in town and coincidentally also one of the presenters. The theme for the evening was Interiors and supported by Better Interiors magazine. Most presentations did respond to the theme and some did take the liberty to stray. First to present was Archana Kushe – she presented a wine rack that she designed and fabricated and it was recently showcased at the 2010 Design Biennale in Kortrijk, Belgium. The concept resonated the idea of pairing wine and cheese. 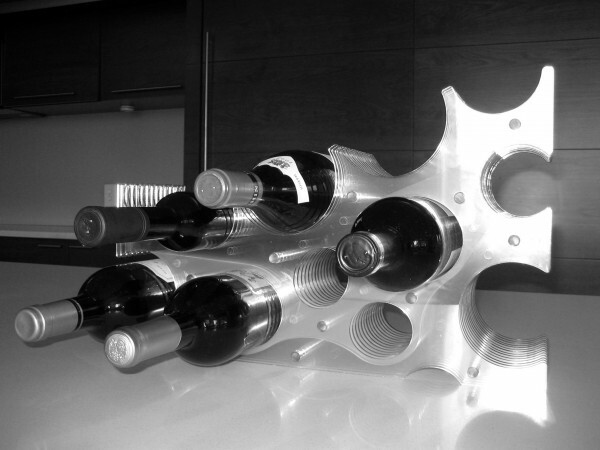 The structure of the wine rack has been cleverly camouflaged within the pattern formed by the family of circles. Kushe also presented other projects that she had worked on in the past which clearly reflected her thought process behind the design and creation of the wine rack. As the evening came to an end she was surrounded by people curious to learn where they could find the wine rack and if it was available for purchase. Kunal Shah, a friend and interior designer was next to present. His presentation was aimed at professionals but definitely provided a good insight to the students present as well. Shah read an excerpt from the book, ‘The Diary of a Social Butterfly’ by Moni Mohsin. The book features a Punjabi convent educated woman who believes life is meant for party-shartying. She is a socialite and refers to her husband as Jaanoo. The excerpt he read refers to Mohsin’s reaction and response to designers penchant for minimalism these days. Shah’s reading was accompanied by a presentation that flashed quotes such as “at-least give me fancy basins, full glass-wale”(at-least specify fancy basins, made of glass) that he has heard from clients. This presentation was delightful, a good insight and did not require visuals. Shah’s presentation was followed by Kaiwan Mehta’s presentation. He presented the paper that he wrote on Roselyne Titaud’s photography of interior spaces. Mehta highlighted the fact that Titaud’s photography is devoid of humans but she is able to capture their actions through their absence. She delves into the idea of the in-between and absence-presence by reflecting memories of the occupied space in absence of the inhabitant or performer of the space. Rajeev Thakker, architect and principal designer at V Raheja Design Construction and the director of Columbia University’s Studio X initiative in Mumbai shared projects that he has approached as an artist. He shared an art gallery project that he designed and his approach reflected an artist’s experience of the space. He also presented a series of drawings titled, ‘City 6.’ Through these drawings he has documented the city of Mumbai and it’s various spatial conditions as experienced by the inhabitants of this city. Interior and exterior private-public spaces like lobbies of theater’s and hotels, swimming pools are what fascinate Christian Gierarths. His photographs like Titaud’s are devoid of human beings but he is able to capture the opulence and energy of a space and build an experience of the space through the quality of light reflected in his images. Gierarths is from Germany and happened to be in India on a fellowship – he mentioned how difficult it was for him to get behind watchmen and acquire permission to shoot inside theater lobbies and private public spaces. He realized that public spaces and public realm in India plays out on the streets and footpaths so he set out on an arduous task of capturing footpaths with no people in his pictures. It took him about two to three hours to take a shot – to capture that one moment when there was no one in his frame. Artist and graduate from Baroda School of Art, Shruti Mahajan shared the project that she and her design associate as well as friend did for Eucalyptus a home deco store. She highlighted how she quilted architecture, the influence of space and experiences from memories that reflect traditions in culture and imagery from nature to design products for Eucalyptus. Designer and photographer Suleiman Merchant ended the presentation by sharing a collection of photographs of interior spaces that reflected the experience of spaces. One photography that stands out in memory was a framed view of the Bandra-Worli Sea Link. It was of an office space with a desk in front of the window and the window framed a view of the sea link, which was captured beautifully. It was a pleasant evening and great to see so many creative minds in one place sharing their work. Not all presentations followed the 20×20 format that is familiar to Pecha Kucha Nights but it indeed was a wonderful experience. Unfortunately while I was in New York I never went for Pecha Kucha, I have heard that there they are a rage. Looking forward to more from Pecha Kucha and Bombay. PKN is open to all and is not limited to artists and designers. Presenters can share hobbies and more. For additional information visit PKN Mumbai. This entry was posted in Architecture, Art, Culture, Design and tagged 2010 Design Biennale, Archana Kushe, Architect, Architecture, art, Balwant Sheth School of Architecture, Better Interiors, Bombay, Christian Gieraths, Columbia University Studio X, Culture, Design, Eucalyptus, Interiors, Japanese, Kaiwan Mehta, Kunal Shah, Mumbai, Pecha Kucha Mumbai, Photography, Rajeev Thakker, Roselyne Titaud, Shruti Mahajan, Suleiman Merchant, V Raheja Design Construction. Bookmark the permalink.